The MINI Cooper S Carbon Edition launched exclusively on Amazon, establishing MINI as the first premium automotive brand in India to offer a limited edition product for booking on an online sales channel. The MINI Cooper S Carbon Edition is available as a Completely Built-Up unit (CBU). The Carbon Edition combines the already powerful MINI Cooper S model with the new John Cooper Works Tuning Kit, along with official John Cooper Works Accessories. The tuning kit allows a precisely measured increase in performance properties and a particularly intense racing sensation. MINI has always got hearts pulsating with its iconic design and go-kart handling. The MINI Cooper S Carbon Edition takes these characteristics even further, making your driving experience more exciting than ever before. Available exclusively on Amazon India, this limited edition MINI Cooper S Carbon Edition along with official John Cooper Works accessories combine authentic sportiness with premium characteristic. The new MINI Cooper S Carbon Edition is available starting at an ex-showroom price of INR 39, 90, 000. Log on to www.amazon.in/mini to book limited edition MINI Cooper S Carbon Edition. 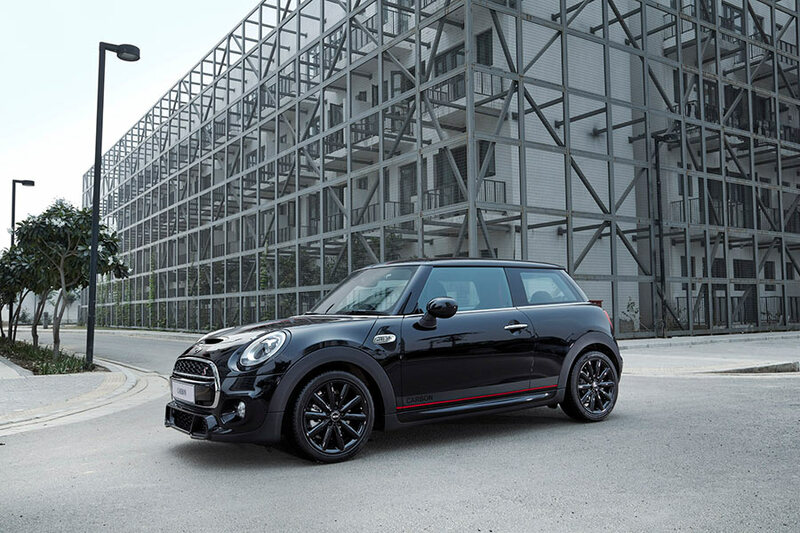 The MINI Cooper S Carbon Edition embodies an unbeatable sporty character and powerful aesthetics. It’s striking design features exclusive matte black sport and side stripes accented by a red pinstripe reinforcing its sporty look. With the word “Carbon” emblazoned on the sides, and coupled with the JCW aerodynamic package, the exterior design already sets the pulse racing. The newly designed LED headlights together with the LED rear lights, surrounded by trim rings in black, add to the appeal of this limited model. The 17-inch light-alloy wheels, sitting inside 205 profile tyres provide an aggressive stance whilst maintaining the sporty look of the car. The John Cooper Works Tuning Kit and Exhaust was designed for and tested on the racetrack. Finished in Carbon Fibre for added sportiness upgrade the power output to 210hp @ 4500 – 6000rpm combined with peak torque of 300Nm @ 1250 – 4600rpm. The interior features a design that strikes the perfect balance between luxury and racing pedigree, with premium workmanship quality in every small detail. 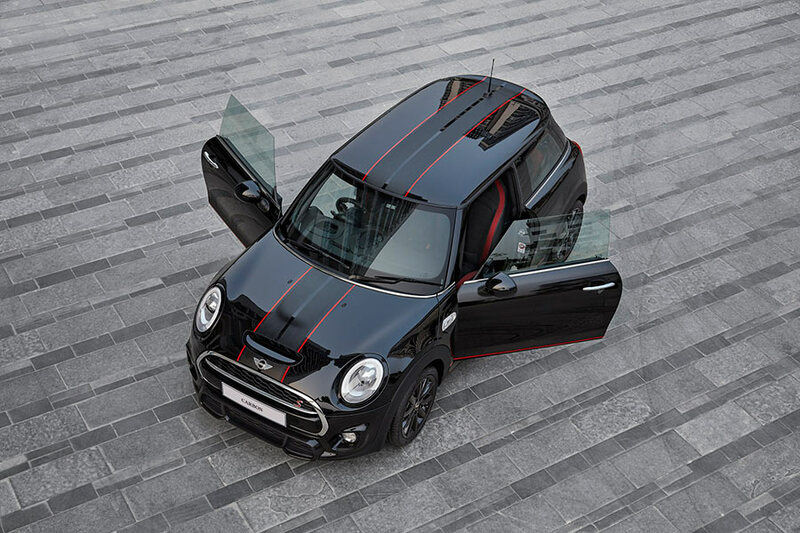 The MINI Cooper S Carbon Edition includes John Cooper Works sports seats, exclusive to this limited edition model in India, with integrated headrests finished in Black Alcantara with contrasting red stitching. Other features that contribute to the unlimited exhilaration include the John Cooper Works leather steering wheel with paddle shifters, the John Cooper Works door sills, the John Cooper Works gear selector lever, accented by the Glowing Red trim. The car’s sporty and exclusive flair is underscored in the interior by means of the anthracite roof liner. Driving excitement is elevated to a higher level with the inclusion of the John Cooper Works Tuning Kit. The 2-litre 4-cylinder petrol engine with TwinPower Turbo Technology makes the MINI Cooper S Carbon Edition the fastest and most powerful MINI in India. The 6-speed Sport automatic transmission, allows for quicker, smoother shifts that can be controlled via the paddle shifters on the steering wheel. Plus, with the added functionality of Launch Control, the racing pedigree of this MINI is well and truly up for display. The three MINI Driving Modes enable an individualised vehicle set-up focusing on either ride comfort, sportiness or efficiency, according to preference. In addition to the standard MID mode, the Sport mode is geared towards active driving fun while the Green mode supports fuel-efficient driving. The Electronic Damper Control sets the suspension of the car dependant on the driving mode that has been selected. Green and MID modes, allow for a softer suspension setting for city driving. However, when the roads allow, in Sport mode, the true go-kart handling of the vehicle can be exploited. The MINI Cooper S Carbon Edition is stacked with cutting-edge safety technology. The standard safety equipment comprises of Front and Passenger Airbags, Brake Assist, 3-Point Seat Belts, Dynamic Stability Control, Crash Sensor, Anti-lock Braking System, Cornering Brake Control and Run-flat Indicator. The standard MINIMALISM technology includes an auto start/stop function, brake energy recuperation, shift point display and electromechanical power steering. The MINI Cooper S Carbon Edition also comes with optional features like MINI Head-up Display, which provides information regarding the media outputs, navigation and telephone options directly in the line of sight for the driver. The optional Wired Package includes Navigation System Professional, a bigger 8.8” screen with Touch Controller and Bluetooth mobile connectivity. The exciting world of MINI Connected is available as standard in the MINI Visual Boost system or the MINI Wired Package.